Exam season is super stressful for students – that’s a given – but no one realises how nerve-wracking it can be for mom and dad, as well! 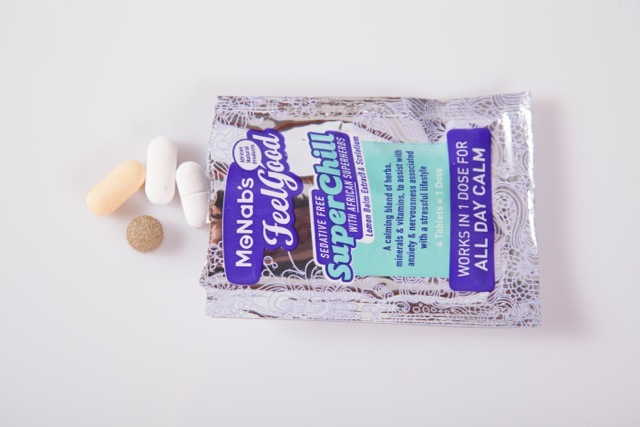 This exam season, keep the chill factor prevalent by dosing the whole family up on SuperChill. The beauty of these tabs? SuperChill contains a calming blend of herbs, minerals, and vitamins that keeps the energy delivery to your brain constant – helping you focus on your studies – while relaxing and calming your – or your parents’ – nerves at the same time. African superherbs Sceletium & Lemon Balm Extract have calming properties to ‘take the edge off’ anxiety and nervousness without making you drowsy. Vitamin B complex helps relieve stress and anxiety, as well as fortifying the nervous system, improving energy levels and boosting the immune system. Calcium and Magnesium (Calmag) helps support and balance muscle and nervous function; calcium helps with muscle contractions, while magnesium relaxes the muscles. Sleep – The best thing you can do for your brain during exam season is get enough sleep. Get between 8-10 hours of shut eye to make sure your brain is performing at its absolute best. You’ll be doing yourself a favour by putting the books away at 8pm the night before an exam and getting shut eye instead of late night cramming. Less caffeine – As tempted as you might be to keep that caffeine buzz going as you study, it unfortunately adds to physiological stress on your body and will reduces your quality of sleep. Exercise daily – It’s so easy to forgo any form of exercise while you’re in study mode, after all, time with your books is priority. The thing is, light exercise is a great stress reliever, so walking around the block, dancing, doing a few squats and lunges, will actually help your focus. Have regular study breaks – Your pre-frontal cortex can only keep focused for limited periods of time. Get up and move every 20 minutes, even a simple few stretches or dance to your favourite music (a wonderful mood booster and stress reliever). Eat regular healthy snacks – Your brain uses a lot of energy during study, so you have to feed it regularly. Instead of sugary energy drinks and sweets, snack on fruit, nuts, carrot sticks with hummus or cottage cheese, cheese and wholegrain crackers. Practise mindfulness techniques – this will improve your ability to concentrate and think clearly.